Uncle Ed Lindsey of Makawao was the recipient of the award shaped like an outrigger-canoe paddle at the "More Fish in the Sea: E Ola Ke Kai, E Ola Kakou" event. KAHULUI – An Upcountry cultural advocate received the Malama I Ke Kai kupuna award at an inaugural ocean-awareness fair April 4 at Maui Community College. Uncle Ed Lindsey of Makawao was the recipient of the award shaped like an outrigger-canoe paddle at the “More Fish in the Sea: E Ola Ke Kai, E Ola Kakou” event. Lindsey is a West Maui native, who retired after teaching social studies and Hawaiiana for 25 years at Iao Intermediate School. Among his community activities, he co-founded the Maui Nui Marine Resources Council and has taught Hawaiian culture in the Ocean Awareness Training course of the Hawaiian Islands Humpback Whale National Marine Sanctuary. 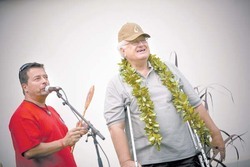 He has served as president of Maui Cultural Lands and of the ‘Ohana Coalition grass-roots political action group. Upon receiving the award, Lindsey spoke of a cultural connection to nature. “The real work is when . . . your hands are in the ground or in the ocean, and you are working with these things that we, as kanaka maoli (Native Hawaiians), have been blessed with,” he said. Lindsey also helped spearhead the eight-year-old Honokowai restoration effort that has mobilized hundreds of volunteers to clear, mostly by hand, 15 acres of loi terraces and other archaeological treasures of Honokowai valley, the former “breadbasket” of Kaanapali. In his acceptance remarks, he shared the ethic – encompassing collaboration, responsibility, love and respect – that has driven his wide-ranging community work. “When we work together we can make a difference,” he said. “Once you pick up this kuleana (responsibility), no can let go. “And don’t look for money, it doesn’t depend on money; it depends on people of heart. All I offer you is tough work. The payback is not measured in money; you can’t buy that. It’s not for a ‘me, my or I’ reason. “Aloha is love,” he concluded, “and compassion and honesty, to give freely without expecting in return, to share. * Kekoa Enomoto can be reached at kekoa@mauinews.com.